Ricard, a prince of Astora, traveled the land with the hope of completing the archetypal hero's journey. Instead, his ill-conceived journey cost him his life and he turned Undead. 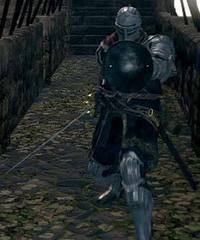 Undead Prince Ricard left Astora and journeyed north to Lordran. Perhaps he thought that he could become a hero in undeath and braved Sen's Fortress to reach Anor Londo. Whatever he hoped to accomplish was not meant to be, as the Chosen Undead finds him Hollow atop the fortress. Ricard is most probably a nod to or inspired by Ostrava from Demon's Souls, who was a prince who wandered the lands in a fateful ill-conceived journey which also ended in tragedy. He was born into royalty, but wandered the lands in a fateful ill-conceived journey.